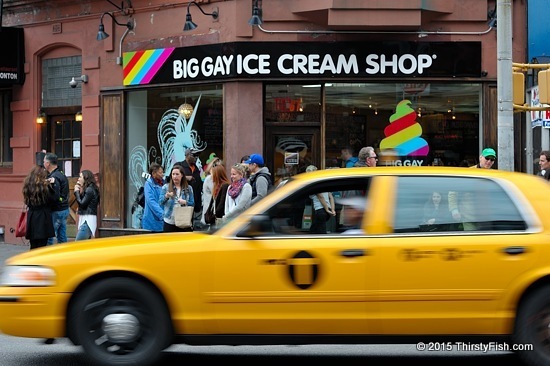 The "Big Gay Ice Cream Shop" in New York City started off as the "Big Gay Ice Cream Truck" in Prospect Park, Brooklyn. Pictured is the West Village store. And there's a store in Philadelphia. The so-called "Religious Freedom Laws" are popping up in many states across the United States. Recently Indiana's version of the law potentially allowing anti-gay discrimination, under pressure from businesses nationwide, had to be reworded. When businesses react and threaten not to do business in discriminating states, state governments respond. Only if there was a way to rally the same businesses on issues such as the environment or climate change? Discrimination against Mother Nature is still a free-for-all.